Bookseller To The Great & Infamous! A visual history of one of childhood’s most beloved icons—the Little Red Wagon—told through a rich collection of photos and stories that highlight its unique place in American culture. For generations, the Radio Flyer—the fire engine red wagon with the distinctive white logo emblazoned on its side—has fueled the imaginative adventures of children, transforming them into astronauts on a rocket ship to the moon, racecar drivers in the Indy 500, and pioneers traveling into the badlands of the Wild West. The Radio Flyer is the story of childhood—a story of wondrous journeys often accompanied by someone important: a parent, a sibling, a friend, a pet. Since 1917, the family-owned business Radio Flyer Inc. has created this cherished wagon, building a legacy of high quality, timeless, and innovative toys that spark children’s imaginations and inspire active play outdoors. With more than 100 million wagons sold—many of them passed down from generation to generation—Radio Flyers have carried, hauled, and fueled more hours of magical escapades than any other children’s ride-on toy in America. This beautifully designed and illustrated keepsake book pays homage to this cultural touchstone as it celebrates its first centenary and embarks on its second. Packed with 250 exclusive full-color and black-and-white illustrations, stories, and original drawings from the Radio Flyer Inc. archives, Radio Flyer chronicles the history of this popular brand for the first time. Radio Flyer’s story is America’s story—a story of an enterprising Italian immigrant’s dream realized, and a testament to the value and strength of family ties. Including a host of tender reminiscences from fans across the country, this touching tribute is a special piece of childhood, and the perfect gift for everyone who’s ever loved a Little Red Wagon. 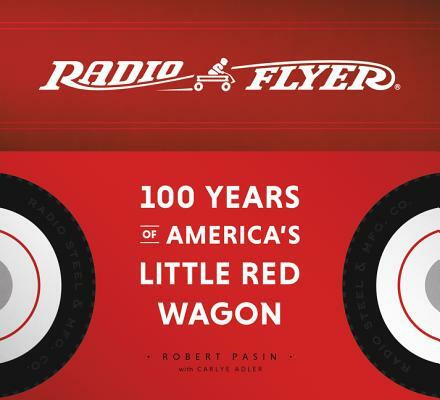 Robert Pasin, grandson of founder Antonio Pasin, is the CWO (Chief Wagon Officer) of Radio Flyer Inc., maker of the famous and beloved little red wagon, and the world and other ride-ons. Radio Flyer has more than one hundred award-winning products available throughout the world. Since 1917, the family-owned company has created beautifully designed, high-quality, timeless, and innovative toys. In his time at the helm, Pasin has led a cultural transformation of the company, resulting in a dynamic, goal-oriented workplace that has received numerous awards and was named among the Best Places to Work by Fortune, a Top Small Workplace by the Wall Street Journal, and one of the 5000 Fastest-Growing Companies in America by Inc. Pasin lives in Oak Park, Illinois, with his wife and four children.